Come and see for yourself ~ inspection warmly invited. Bookings are not made definite until a non-refundable deposit of £4 per cat per day has been paid. 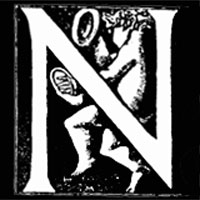 We reserve the right to release any space for which a deposit has not been paid. The remaining balance payment is due at the time of collection. In the event of an owner returning before the end of a booked period the full period will be charged. Deposits for cancelled bookings can only be refunded at our discretion and if the booking period is successfully rebooked. Specialcats of Ayr, Weston Cottage, Weston Brae, Annbank, Ayr, KA6 5EY. Fees are charged for both the day of arrival and day of departure to allow for essential disinfection and airing time, and for preparation and pre-heating of chalets. Heating, insurance, grooming (coat and claw care) are all included. There is no extra charge for prescription or unusual diets but a minimum of 7 days notice is required to allow us to source them please. All cats must have current vaccination certificates for feline enteritis and cat ‘flu, to the recommendation of their vet. The course should be completed at least ten days before the date of boarding. Please telephone if this is a problem. We understand that there will be special cases such as immune-suppressed cats where the vet may advise against vaccine. In the event of a cat becoming ill whilst in our care, your own vet will be consulted. If it is reasonable to do so, your own vet will be used for any treatment required. Where your vet is more than 30 minutes drive away, we will use our own vet who can liaise with yours for medical history. Subsequent veterinary treatment decisions are best between vet and owner so it is advisable you leave a contact number or we must act on the vet’s advice in your place. The cattery insurance covers vet fees except for pre-existing conditions, kittening and vaccinations, up to a maximum £2000. We do not have full online booking available, you can download and edit the booking form here. Please feel free to send an enquiry by email or phone 01292 520543. 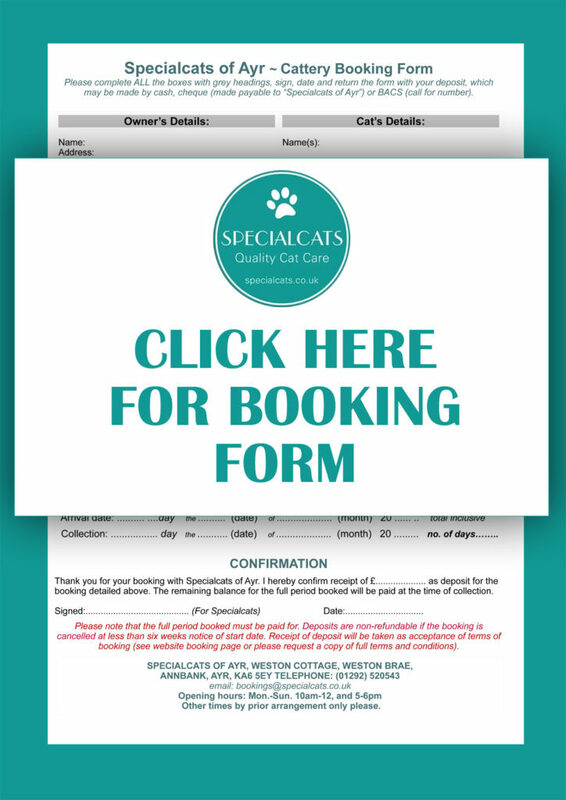 By booking accommodation at Specialcats you are deemed to have accepted our terms and conditions of service (download below) which covers what you can expect, things like medications and health, cats sharing and our responsibilities to each other. Please do read this. A deposit of £4 per cat per day is payable at the time of booking with the balance due at the time of collection. In the event of an owner returning before the end of a booked period the full period will be charged. Deposits for bookings cancelled at less than six weeks notice (prior to start of stay) will NOT be refunded. Please click on the links to open up important and useful documents about Specialcats. When transporting your cat please ensure he/she is in a secure basket or container or wearing a properly fitting harness. Travel can be stressful for a cat. You can lessen the stress by using pheromone sprays on baskets; by rehearsing the route to us using online mapping and visiting by yourself; visualising to your cat where you are heading, letting your cat know how relaxed and safe he will soon feel.